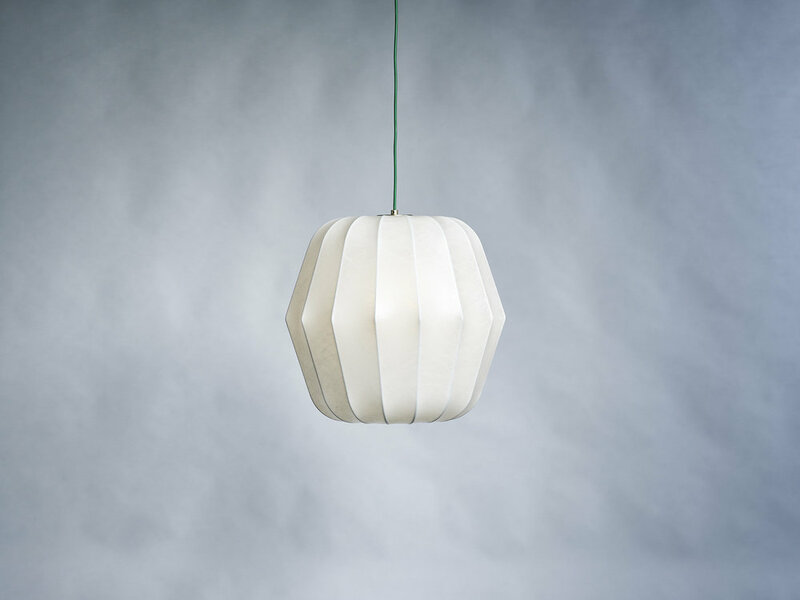 Lantern was designed in 2006 by Carsten Jörgensen. Often the extraordinary is tracing a designers mind and sometimes it might make sense to go for the ordinary and imagine that the application of something ordinary can stand out by becoming a long acquaintance. The Lantern is such a thing and could not be expressed better than through a quote by Isaac Newton: “My powers are ordinary. Only my application brings me success”. In a domestic or a public space the Lantern will easily find an application. 50 cm in diameter and 45 cm high with a power cord of 4 meter it can be placed in nearly all kind of spaces singularly or in rows or clusters. Even when an appearance seams ordinary it shall not be forgotten that it can spread a beautiful ambient light. The lantern is providing a spherical 360° diffused light. Hanging over a table alone or in a row of two or three it will illuminate all colourful dishes in a way that will awake an appetite for the delicious food prepared. Due to the dim-ability of the light source it is easy to adjust the intensity of the light coming from the Lantern and to change the ambiance of a specific room or for a specific occasion. Often you are placed at a table where the rendering of the colours dotting appear as a brownish soup; or the light is so intense or so little that you lose your appetite. Each occasion needs its specific light to be remembered. The lighting source included is a dimmable A++ LED bulb with a milky finish providing 800 lumen at 10-watt, the same as a 75-watt incandescent light. The colour of emitting light measured at the bulb is 2700 Kelvin, meaning the warmer end of the color spectrum toward yellow. The actual provided light measured at the screen is 2800 Kelvin and is for smaller rooms a good ambient light. The colour rendering ability (Ra / CRI) is rated to Ra 90. An incandescent light will in comparison provide Ra 100, meaning that the colour rendering ability by LEDs is less but then in comparison to other electrical light sources is the most energy saving light source known. This is the reason we have chosen LED, simply because we find it the ultimate light for the cocooning lamps. The guaranteed life cycle of the madetostay LED bulbs are 25000 hours, the same as for the guarantee of the Lantern. Shaped over an internal white powder coated steel structure supporting the cocooning polymer (plastic) fibre the cocooning screen is provided with two protecting translucent matt lacquer finishes making it possible to clean the surface of dust and other emissions from the air. The cocooning is soft and can withstand pressure from non sharp objects. If deformed it will after a short time regenerate to its original shape but should not be set under continuous pressure from any objects. Lantern is delivered with 4 meters of power cord with your choice of 4 colours; black, white, red and orange. To cover the ceiling power outlet we have included a simple to install white metal cover, which allows for three lamps to be connected and hanged in a cluster.